It's a simple question, really, with an equally simple answer, yet the vast majority of riders don't know. Most of us don't even think about it, we just know that it works. By now, I assume, most of us have read the threads regarding counter steering and realize that that is what gets our bikes to turn. In all actuality, counter steering is what gets our bike to lean, so that it will turn. So, here's the question: Why do our bikes turn when we lean them? Why don't they just go straight while leaned over? Well now, that would certainly keep us from going straight when leaned over, but not exactly the answer I was looking for. Anyone else care to give it a shot? Anyone? You sir, in the back of the class? No? I'll give y'all a little more time to think about it. What exact answer are you looking for? Cause is a marvelous thing that yields an answer sufficiently complex enough that those parts of my mind I haven't used since high school went "Hmm? Hey... Is...? Is he thinking again?!?" It’s very important to understand that accurate two-wheeler steering is a matter of pushing on the handlebar grips, not just leaning weight in the saddle. Obviously, a bike needs to lean toward the curve in order to turn. And you can make it lean just by shifting your weight in the saddle, or nudging the tank with your knees. But the easiest and most accurate way to control lean is by momentarily steering the front wheel opposite the way you want to go. The out-tracking of the front tire forces the bike to lean. To turn left, press on the left grip. To lean and turn right, momentarily press on the right grip. It’s called "countersteering". That momentary push on the grips is just the first part of a process of balancing and steering a motorcycle. That initial input is called "countersteering" because you momentarily steer the front wheel opposite, or "counter" to the direction you want to go. But as the bike leans over to the angle you need to make the corner, you allow the front wheel to recenter, and even steer slightly toward the curve. Leaned over, front tire traction forces the bike to turn. The bike is held at the same lean angle by gravity being balanced against centrifugal force. Pressing the grips right causes the front wheel to track left, and tire traction forces the motorcycle to lean toward the right. This process repeats over and over again as a rider makes adjustments to balance and direction. Front end geometry also contributes to balance--the front wheel keeps trying to recenter itself with the bike vertical. But even in a "straight" line, the front wheel weaves slightly from side to side as the bike’s geometry and the rider’s steering input work together to control balance and direction. Countersteering is just the first part of the cornering process. As the bike rolls over to the angle of lean you think is about right for the corner, you allow the front wheel to recenter. The front tire pushing the bike toward the turn generates "centrifugal force". The bike is kept from falling over by centrifugal force balanced against gravity. Easy there, Kuroshio. The answer is really simple. I promise it isn't a complex concept. It's something even an average grade school kid can understand. I don't mean to prolong your agony, and I hope you'll be patient with me, but I was hoping to get a few more responses before I spill the beans. The answer comes from an article I read years ago that explains counter steering and why it works. Jules had a good idea, getting every one to believe in counter steering, I just want to make it clear why it works. Stretch-the-apex, that's a great explanation of counter steering, but it doesn't explain why the bike turns. 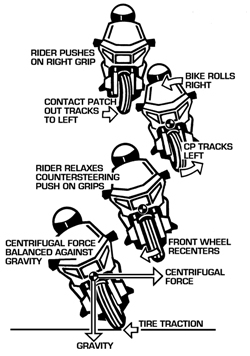 Centrifugal forces are why the bike needs counter steering, the cent. forces try to keep the motorcycle in an upright state until you turn the handlebars. You guys are gonna be pissed. I know your gonna say "Anybody knows that." whenever I tell you the answer. So, why does the bike turn when it's leaned over? Last edited by sparkman; 10-16-2010 at 08:50 PM. "front tire traction forces the bike to turn"
from my original post, second paragraph, second to last sentence. Keith Code built something he calls a no B.S. bike in which he proved that a rider cannot turn a bike simply by leaning. Input to the bars (countersteering), whether consciously or otherwise, is needed or it will simply continue to travel in a straight line. Here is an excerpt from the article and a link to the entire story if anyone wants to read it. At this writing, we have run nearly 100 riders of all experience levels on this double-barred bike. It has made believers out of every single one in the actuality of countersteering of course. Even at speeds of no more than 20 to 35 mph, no matter how much you tug or push or pull or jump around on the bike, the best we saw was that the bike wiggled and became somewhat unstable. Did it turn? Not really. Would it turn at higher speed? Absolutely not. Could you avoid something in your path? No Way. Could anyone quick turn the bike? Hopeless! The best result was one of my riding coaches. He got into a full hang-off position and was able to persuade the bike, by jerking on it, to start on a wide, wide arc in the paddock at Laguna Seca, a piece of asphalt that is about 500 X 800 feet. Like turning an oil tanker ship, start at noon and be on the turning arc at around 1:00 PM. It wasn't smooth and it wasn't very effective.